Less than a month ago, all four Welsh regions lost on the same weekend for the first time since the 2012/13 season; Wales would finish that international season as Six Nations champions. Six years later, and as Warren Gatland boldly predicted on the eve of the tournament, a fourth Grand Slam awaits in a heaving Welsh capital this Saturday. Mary Street will be thronged from the night before with an expectant population awaiting another coronation for their national side, blissfully ignorant of the fact that the entire edifice is built upon sand. It will rank as one of the most remarkable achievements in the sport, disbarring all logic, and once more confirming Gatland's status as one of the foremost coaching facilitators in the world game. True, there may be better intellectual minds out there - Joe Schmidt amongst them - but nobody can gainsay the sense that Gatland's spectacular efforts mark him out as something special. Without any coherent structure or effective player pathway beneath him, and dogged at every step by internecine politicking among blazers who are supposed to be supportive, the Kiwi still somehow manages to pull together a nation otherwise intent on pulling itself to pieces. "In a strange way," the former Ireland coach explained last week, "I think the players find life in the Wales camp a nice distraction from everything that's going on outside." Quite the understatement when one considers that 24 members of Gatland's squad are out of contract this summer. Wales are on an historic 13-game winning streak and are favourites to win a fifth Six Nations title since 2005 and a third Grand Slam in those 14 years. Ireland have only ever won three Grand Slams and as even New Zealand, winners of the last two World Cups have acknowledged, the system in which Joe Schmidt's operates is a model to which all should aspire. And yet what the Welsh are able to achieve at international level is the envy of so many, in stark contrast to a chaotic and calamitous domestic structure which is not. Their record at club or regional level is abysmal, certainly if compared to their visitors this weekend; Ireland have provided six winners of the Champions Cup since Wales won that Grand Slam in 2005. A Welsh team haven't come close. The convulsive nature of Welsh rugby exploded into being once more earlier this month when the now infamous on/off merger between Scarlets and Ospreys exposed the latent schism between the Welsh Rugby Union (WRU) and their four regions (albeit Dragons are now owned by the WRU). Unlike Ireland, where there is now a seamless working relationship - sometimes not cordial but rarely toxic - between the union and their four provinces, in Wales, both sides operate with deeply-held suspicions about the other's underlying motivation. Since regional restructuring in 2003 - consigning Caerphilly, Ebbw Vale, Swansea, Llanelli, Neath, Pontypridd, Bridgend and Newport to dust - Welsh rugby has never become attached to their four regions. Unlike the historically and geographically fortunate occurrence of the four provinces in Ireland, the attempts to merge Neath and Swansea (Ospreys) were just one example of a flawed concept. Also, the north of the country has no rugby presence at all. Supporters never bought the concept or tickets and, without necessary incomes many of Wales' best players fled the country, beyond the union's control and influence. 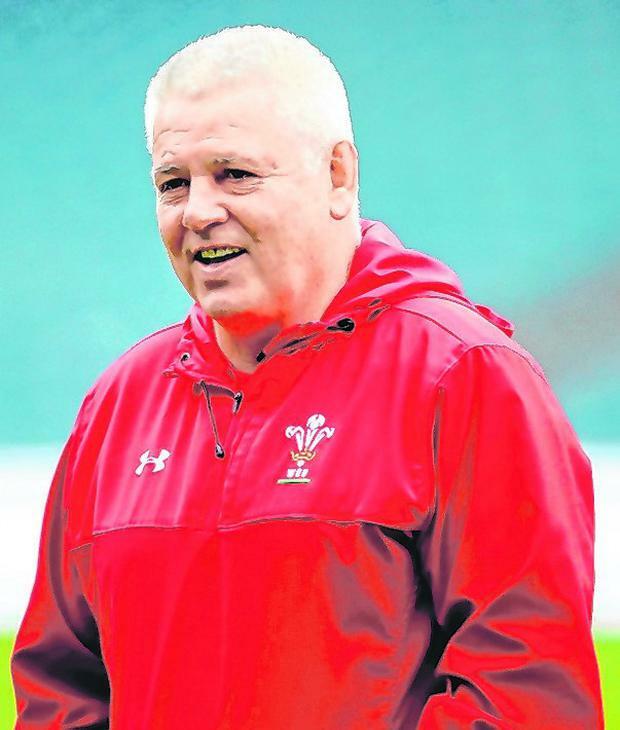 Nonetheless, whether it was Mike Ruddock, the Lansdowne RFC coach who led Wales to a Grand Slam just two years after the seismic shake-up in 2003, or most notably Gatland, when the players gather to wear the red jersey and stand for the anthems, they become as one. "It has been challenging at times," he says. "I'm a bit wary of where Wales are going to go in the future and what is going to happen. We need the regions to be successful by competing in Europe and the PRO14. "Ireland are benefiting from the performances of their provinces and Wales need the regions to be doing that. There is no doubt that we are punching massively above our weight." If only they could stop punching each other, one wonders what heights the Welsh could achieve? "From a national point of view we are in a good place," said Gatland a few years back and it is a statement which has held up reasonably well as he eyes a World Cup swansong in Japan. "We have achieved a lot for a country that has a small playing base. If we can sort out the politics of the club game, getting some peace and harmony, that would be really very nice."